The New Horizons Long Range Reconnaissance Imager (LORRI) snapped this photo of Jupiter's ring system on February 24, 2007, from a distance of 7.1 million kilometers (4.4 million miles). This processed image shows a narrow ring, about 1,000 kilometers (600 miles) wide, with a fainter sheet of material inside it. "This is one of the clearest pictures ever taken of Jupiter's faint ring system," says Dr. Mark Showalter, a planetary astronomer from the SETI Institute in Mountain View, Calif., who planned many of the ring images. "The ring looks different from what we expected � it has usually appeared much wider." Showalter suggests that the ring's largest boulders are corralled into a narrow belt by the influence of Jupiter's two innermost moons, Adrastea and Metis. The ring also appears to darken in the middle, a possible hint that a smaller, undiscovered moon is clearing out a gap. "If there is a smaller moon within those rings, we hope to see it in some of the hundreds of additional images that New Horizons will transmit back to Earth over the next several weeks," says Dr. Andy Cheng, LORRI principal investigator from the Johns Hopkins University Applied Physics Laboratory in Laurel, Md. Click here for an annotated version of the image. Showalter adds that the faint glow extending in from the ring is likely caused by fine dust that diffuses in toward Jupiter. 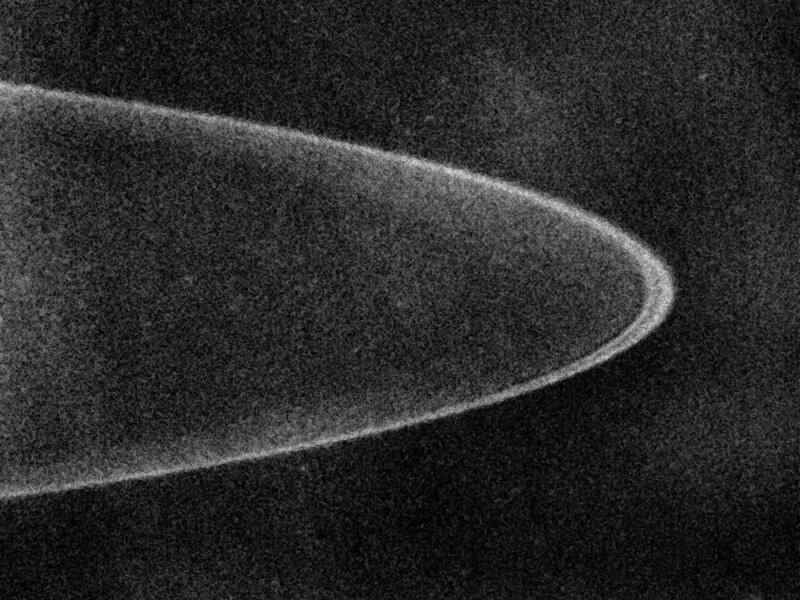 This is the outer tip of the "halo," a cloud of dust that extends down to Jupiter's cloud tops. The dust will glow much brighter in pictures taken after New Horizons passes to the far side of Jupiter and looks back at the rings, which will then be sunlit from behind. Jupiter's ring system was discovered in 1979, when astronomers spied it in a single image taken by the Voyager 1 spacecraft. Months later, Voyager 2 carried out more extensive imaging of the system. It has since been examined by NASA's Galileo and Cassini spacecraft, as well as by the Hubble Space Telescope and large ground-based observatories.